The cool cucumber is an all-time favourite among most of us. In this recipe, cucumber is topped with flavoured lebanese hummus which is a power house of nutrients like omega 3 fatty acids, protein, iron and folic acid. 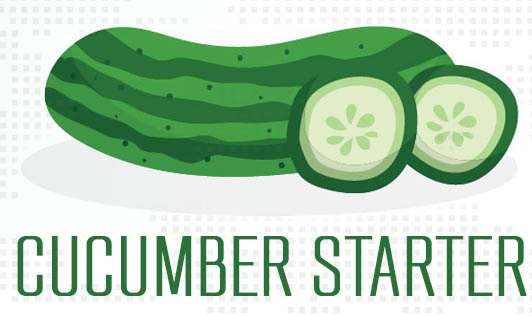 An innovative and irresistible way to relish the healthy cucumber, Try this recipe! 1. Apply ¼ tsp of oil evenly over the red capsicum. Pierce it with a fork and roast it over an open medium flame till it turns black in colour from all the sides. 2. Immerse it in water and remove the skin, stem and seeds and cut into thin strips. Keep aside for the garnish. 3. Combine all the ingredients, except the cucumber slices and blend in a mixer to a smooth mixture using little water till smooth. 4. Arrange the cucumber slices on a flat dry surface and top each cucumber slice with little topping mixture.